Near the upper end of Talking Water Gardens this week. Albany’s Talking Water Gardens once again has plenty of water after being almost drained over the past few weeks to help get new plants established in the shallow ponds. 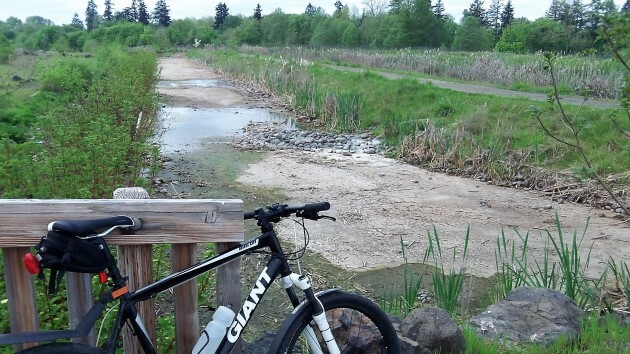 The plant cover has been an issue, because without it these constructed wetlands can’t meet their intended purpose of reducing the temperature of water being discharged to the Willamette River. 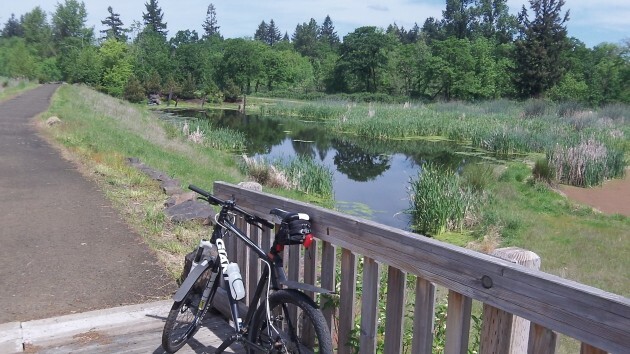 As explained to me by Chris Bailey, the director of Albany Public Works Operations, the Water Gardens’ temperature goal is based on the idea that its ponds are 90 percent covered with cattails and other vegetation. But so far the best that has been achieved is 65 percent coverage. Efforts to get more plants to grow continue, and to do that, the water level has to be lowered now and then. The problem seems to be that the soil under the ponds is more solid than the plants like for their roots to spread. The 50-acre wetlands, constructed at a cost of about $14 million, opened with a public ceremony in June 2012. Albany, Millersburg and ATI Wah Chang cooperated on the project with the goal of meeting clean-water regulations on the Willamette River, which include that the river temperature be kept below certain values in order to help salmon and steelhead, which are listed as threatened. The temperature regime is complicated, but at the 2012 ceremony speakers said the idea was that treated wastewater from the Albany-Millersburg sewage treatment plant (“Water Reclamation Facility”) would enter the wetlands at 72 degrees F and be cooled to 68 degrees before entering the river. Since then, state temperature rules on the Willamette have been set aside because of court action and are being rewritten, but the goal remains: Trying to keep the river cooler than it is naturally at certain times of the year. And so Talking Water keeps working on getting more plants established so that the wetlands can accomplish what it is intended to do. This part of the gardens was nearly dry when the picture was taken earlier this month. Form and function! A for effort? It is an interesting area to walk if you have not. Be careful though. As you’ve documented HH, it is a treacherous entrance. Roll carefully! This whole fiasco is intended to cover up the EXPENSIVE water treatment plant that has failed to perform adequately. What’s the next “bandage” on the scab? Why not build an underground pipe (for cooling) from the Santiam canal and dump the water into the treatment plant discharge to help reduce temperature when needed. The CITY would balk of course, because they don’t want to lose AS MUCH money attempting to operate their electric power plant. I was handed a few installations to make viable during my career. Those that used new (read that as unproven) technology took a little while to tweak and tune. Since the alternative was site shutdown, there was much incentive to succeed. This bioreactor isn’t fully tuned yet. Let ’em do their work.